For a taste of authentic Asian comfort food, look no farther than the hand-me-down family recipes served up by Duc’s of Woodbury. Fast forward to 1978. After four failed attempts to leave the country, he and his mom, Xuan Phan, became what Kim calls “boat people,” fleeing the bleak aftermath of the Vietnam War on teetering fishing vessels and ending up at a Malaysian refugee camp for 18 months. “It’s a pretty crazy story. I was 10 when we finally got out. We spoke almost no English and I had almost no formal schooling,” he says, recalling being homeschooled ever since communists took over his home country. And despite being in a tough situation already, his mom took in three orphaned children they met at the camp. That’s when Guardian Angel Catholic Church of Woodbury’s Welcoming the Stranger: Refugee Resettlement program got involved, sponsoring the family’s move and resettlement in the U.S. Slowly, they learned some English, got the hang of public transportation, and got on their feet financially. In high school, Kim got his first job in a restaurant, learning high-end cooking and the business side of things first-hand from the team at Forepaughs in St. Paul. At 18, he trained as a bartender. He did a stint working at a bank, saving up money so that at age 27, with the help of his mom, he could open a restaurant. So in 1996, on the corner of Radio and Tamarack, Duc’s opened with a full lineup of traditional Vietnamese and Chinese dishes for eat-in or takeout. The team uses exclusively family recipes—some from an uncle and cousin who are also in the restaurant business stateside—letting the flavors of Asia sing. “The flavor we use—the sauce—it’s exactly what I use at home,” Kim says. “It really needs to satisfy me before I’ll serve it to a customer.” The “Duc’s Favorites” stir-fries are popular, in spicy Kung Pao, Szechwan, coconut-curry, sesame or garlic sauce flavors with a choice of meat. The sauteed deep fried potatoes are cooked with onions and a choice of meat in a milder sauce. There are chicken and shrimp dishes with a variety of sauces and veggies, with tailorable amounts of spice. They’re all cooked to order, with fresh, from-scratch sauces. The famous egg rolls and dipping sauce are also made entirely in-house, a labor of love. After more than 20 years in the business, Kim has found a niche in the Woodbury area, topping local Trip Advisor rankings with a die-hard clientele that keeps coming back. 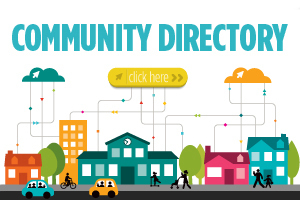 With a bevy of regular specials and affordable lunch options for local professionals, Duc’s has become a fixture in the community. But it’s not always easy. In the Mood Phô Soup? 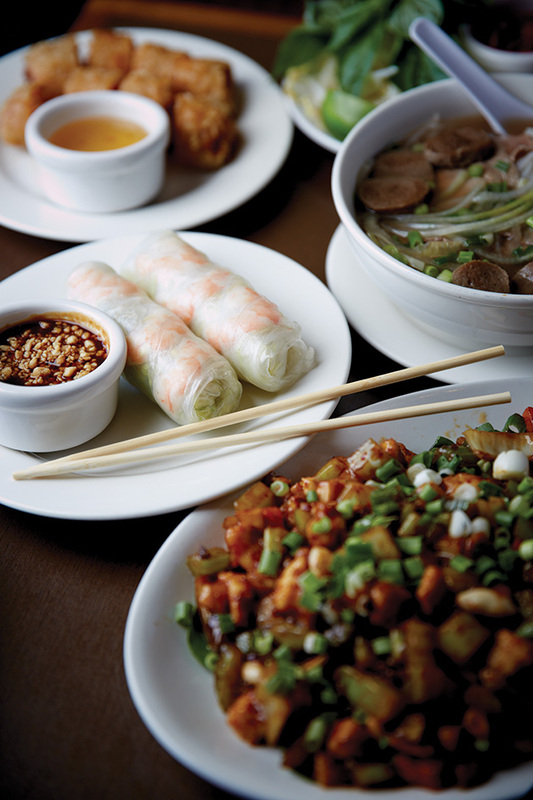 Made-to-order stir fries and traditional noodle dishes top the list of favorites at Duc’s. But this time of year, there’s nothing better than the traditional Vietnamese comfort food, phô (Pro tip: it’s pronounced “fuh”). “Winter is here,” says Kim. “When the weather changes, that definitely gets more popular. It tastes good and makes you feel good.” He says the family recipe starts with a generous simmer—10 to 12 hours, to be exact—to extract all the flavor from beef knuckle bones. The base broth is flavored with lemongrass, star anise, ginger, onions, salt, sugar and Vietnamese herbs before meat (chicken or beef meatball), bánh phô rice noodles and a touch of srirarcha or hoisin sauces are added for a little extra umami. 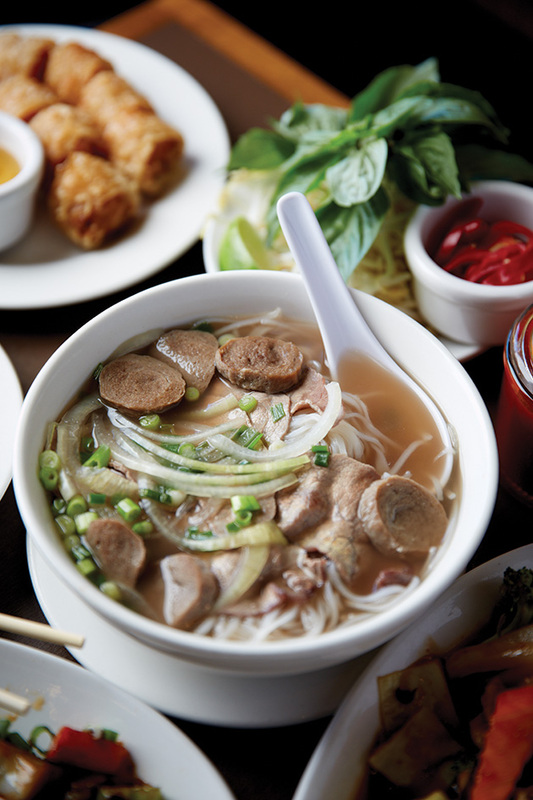 The rural phô dish has hit the mainstream in a big way in recent years, thanks to its strong yet well-balanced flavors and warming properties that’ll stand up to any Minnesota winter. Want to try a bowl of something a little different? There are ten other soup variations on the menu, featuring wider rice stick noodles or mì egg noodles with five protein options each. All of Duc’s soups are served piping hot with fresh basil and bean sprouts, and an optional side of egg or spring rolls—with from-scratch, house-made dipping sauce—can be added to round out the meal. Rank out of 80 Woodbury restaurants on Trip Advisor. “I’m not sure who’s happier about that…our customers or us!” Kim says.